Sheriff-Elect Leavitt was born the son of E. Forrest Leavitt and Florence G. Leavitt on July 7, 1908. After attending local schools, Parsonsfield Seminary and later graduating from Brewster Academy, Sheriff Leavitt was sworn in by Sheriff James Welch as his deputy on April 1, 1931 at the age of 23 years, thus becoming the youngest deputy to serve under Sheriff Welch. Harry Leavitt served with distinction as deputy to Sheriff Welch for a period of fifteen years until he was elected High Sheriff of Carroll County to take office in January of 1947. 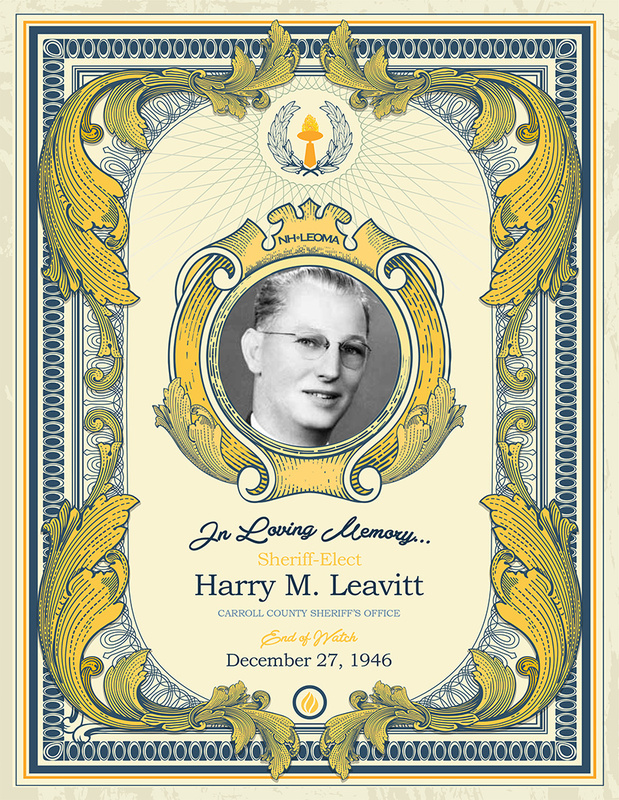 Mr. Leavitt never assumed his elected office for on December 27, 1946, while returning home from transporting a prisoner to the State Hospital in Concord, he was killed when his car left the road and struck a tree. Sheriff-Elect Leavitt left behind a wife and an 8-year-old son.